A few weeks ago I received my World Vision Gift Catalogue in the mail. I have to tell you I was pretty excited. I’ve seen the catalogue online before and have always thought it was a pretty cool idea but, to be perfectly honest, that’s as far as it went. In the past I have never actually purchased any World Vision gifts. However, now that my family sponsors a child through World Vision my thinking has changed quite a bit. I know that our $39 a month is helping to make an improvement in the lives of our sponsored child (a 2 year old girl) and her family in India but I also know that I can do more. When I browsed through the catalogue and read about how much the World Vision gifts can help a family or community I really began to realize what a huge impact these gifts have. This is just one example of how World Vision gift changes lives. There are so many gifts to pickfrom. You can choose from animals, agricultural supplies, medicine and medical supplies, school supplies, supporting education and at risk youth programs, emergency supplies – just to name a few. I understand that for some people helping kids and families a little closer to home is important too. World Vision understands that and provides options to do just that as well. You can gift the gift of school supplies to Canadian children, help to feed a hungry family or contribute to the Canadian Assistance Fund which brings essentials like clothing, food and safe housing to families right here at home. 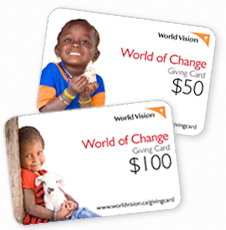 Another option for giving you will find in the World Vision Gift Catalogue are the Giving Cards. You can purchase a card for any amount (starting at $30) and give it as you would any gift card. Your recipient can then chose the World Vision gift(s) that they would like to give to help children and families around the world. Gifts in the World Vision Gift Catalogue start at $30. That $30 can have a huge impact on someone’s life. For $30 you can chose to give a life changing gift like fruit trees (five of them actually). Those five trees provide food and income to a family that desperately need it. We haven’t decided yet how we are going to give a gift that changes lives. We might pick something from the catalogue, gift a giving card to family or we also have the option of giving gifts directly to the community of the child that we already sponsor. There are so many options! I do know that this is important to me and that teaching my young daughter the value of giving to those that need it is also important. We are not a “wealthy” family in terms of money by any means. We have bills to pay and my husband and I both work hard to support our family. But, we do understand that we are fortunate to have the things we do have and there are times, like most people, that we forget just how blessed we really are. This Christmas we will try not to forget how lucky we are and share with those that could use a little of that luck. Want to learn more about World Vision? The giving cards are wonderful! It's something I should think about doing.